There’s nothing that we Americans cherish more than a trip down memory lane, all the while peering into a future that we hope will bring us to wherever we want to be and whatever we long to do. We love to reminiscence about bygone days; to also reflect on dramatic dreams that transport us to exotic places filled with exhilarating adventures or inspire us to achieve the unachievable. Even if we don’t get there or can’t do that or haven’t tried yet, we nevertheless paint pictures, tell stories, write books, and make movies that whet our appetite to actually or vicariously follow and fulfill those dreams. From the pre-Baby Boomer generation right down to Generation X, hardly any among us doesn’t know, has never heard, or hasn’t seen one such classic tale of a young girl’s fantasy of faraway places … to do more and be more than she ever could be or do at home. Yes, I’m talking about the award-winning movie released a whopping 77 years ago, The Wizard of Oz! It was a masterful story beginning with the humdrum life of a small town Kansas family whose daughter was happy, but she longed for a place and a purpose somewhere over the rainbow. Suddenly her lackluster black and white existence exploded into a world of captivating color, filled with characters and creatures that would both help and hinder her ambiguous ambition to get to an even more beautiful paradise over the rainbow. It would be easy to get there; just follow the yellow brick road. Of course, there was much more to it than a road with yellow bricks. Such paths can be fraught with danger. 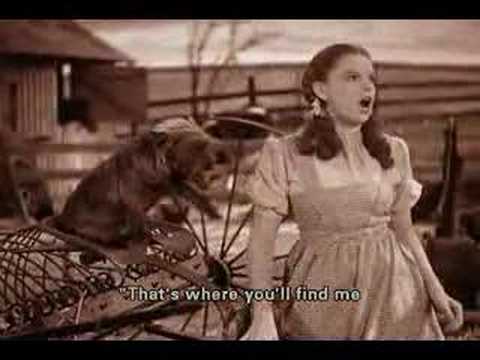 Though Dorothy would be encouraged by munchkins and accompanied by faithful friends (Scarecrow, Tin Man, and Lion), there were formidable obstacles in her quest to find her real home. For a while she really wasn’t sure what or where this home might be. Could or should it be the beautiful land in which she found herself? Would The Emerald City be a heavenly destination? Maybe, but what about her home in Kansas? Yes, it must be her home in Kansas. Alongside of other authors who have written much about the Wizard of Oz, it would be fun to explore the symbolism of this film in more detail; but that is obviously not the specific purpose or genre of this or any Eye of Prophecy article. Rather the thematic commitment of Eye of Prophecy stated on the home page of this website is: “For the essence of prophecy is to provide a clear witness for Jesus” (Revelation 19:10). However, I will offer one observation: Although the movie was a delightful fantasy that in some ways metaphorically depicted real life including our dreams and aspirations, it also has a dark side. And I’m not alluding to wicked witches and flying monkeys and poppy fields. Rather, I’m referring to the deceitfully clever two-part world view conveyed by the author of the book from which the movie was made: (1) our home on this earth is, by far, the best and only home we will ever have. (2) We, alone, have the power within us to make a heaven on this earth. All Dorothy needed to do was to make a wish, click the heels of her magic slippers three times and presto…! On the contrary: There is a heaven … it’s real. According to the true and living God of the Bible, it is a far better place than this wicked, warped, war-torn, is-this-all-there-is world of ours. God has promised that all who believe and receive the sacrificial atonement of his only Son, Messiah Jesus, will one day be with him and the host of heaven, where we will live forever. “…Look, God’s home is now among his people. He will live with them, and they will be his people (believers in Messiah Jesus). God himself will be with them. He will wipe every tear from their eyes, and there will be no more death or sorrow or crying or pain. 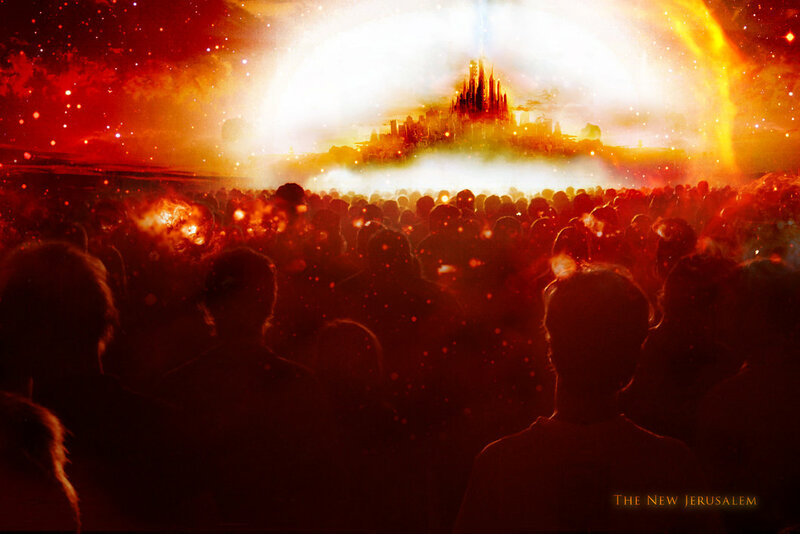 All these things are gone forever” (Revelation 21:3-4). If anyone thinks that their home on this earth is all there is or will be, then let’s take a look at just one city in the Middle East that gives a whole new meaning to there’s no place like home. But with a polar opposite. It conjures a stark reality that can be recalled vividly by those who lived in European cities during World War II, or to those of us who have looked at photographs or seen film footage of the destruction. Cities in Poland or France that were reduced to rubble by massive bombing raids conducted by the German Luftwaffe. Or cities in China demolished by the Japanese. Or out of necessary effort to win the war, German cities leveled by Allied bombers. I’ve chosen this city because its name is Homs—located in western Syria not far from the Mediterranean Sea about 150 miles due north of Damascus, the capital of Syria. In the entire world, there’s no place like Hom(e)s. Sadly, not any way, shape, or form in a positive or optimistically nostalgic sense of the famous phrase uttered by Dorothy that magically whisked her back to what she believed was the only real home she would ever have or need. 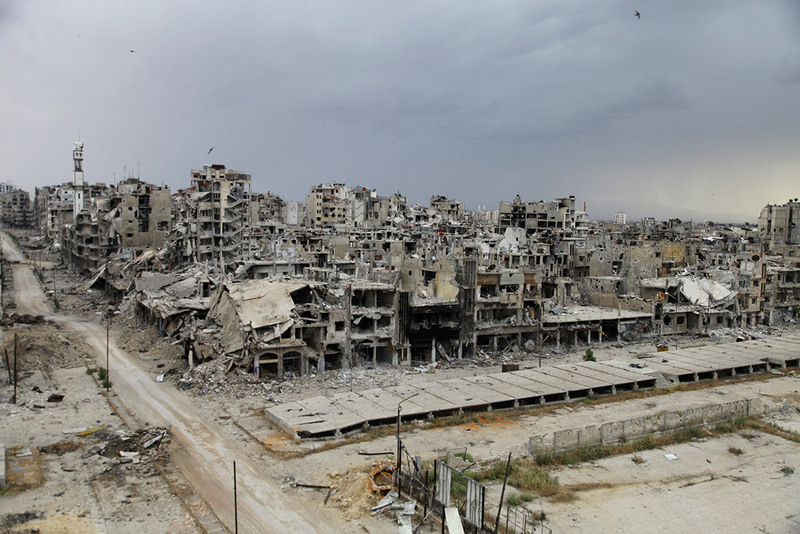 Indeed, the deplorable destruction of Homs is mind-boggling, yet this devastation is a precursor of even greater carnage to come especially during the Great Tribulation. Some of this world-wide catastrophe will be inflicted by war; some by the direct hand of Almighty God. For example, God’s final judgment of the earth: “…And a great earthquake struck—the worst since people were placed on the earth. The great city of Babylon split into three sections, and the cities of many nations fell into heaps of rubble … and every island disappeared, and all the mountains were leveled” (Revelation 16:18-20). Along with Arab Spring uprisings that took place in Middle East Arab countries like Libya and Egypt (that have deteriorated into an Arab Winter), Syrians began their opposition with peaceful protests against President Bashar al-Assad and his repressive government. At the time this was more than just the majority of Syrian Sunni Muslims aligning against the minority Alawite sect of Islam practiced by Assad and his regime. It was a concerted effort of the common people to alleviate the horrible economic conditions and gain more freedom from their oppressors. 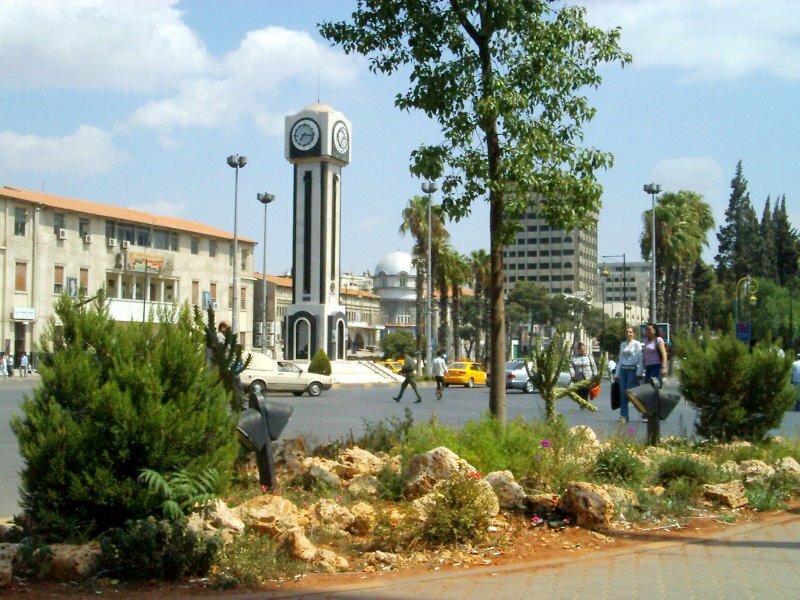 With a prewar population around 1.2 million (some sources say closer to 1.5 million), Homs was the third largest city in Syria, behind Aleppo and Damascus. If not the first, Homs was one of the first cities to protest Assad’s tyranny over Syria. This protest took place in March, 2011. Assad responded with unnecessarily violent and relentless armed force, with no alternative of the protestors but to defend themselves or risk more deprivation, imprisonment, and death. In order to remain in power, it was clearly Assad’s intent to completely crush all opposition, peaceful or not. To minimize government troop casualties, Assad laid siege to Homs, with a deliberate strategy to starve not only the rebels but also the entire population. This led to hundreds of thousands in Homs (and all over Syria) to flee; which, in turn, has produced some four million Syria refugees. For nearly three years Syrian insurgents fighting for The Free Syrian Army under the quasi-government labeled the National Coalition for Syrian Revolutionary and Opposition Forces scored several victories over government troops. So much so that Assad controlled less than 20% of Syria at one time or another. However, in the last two years, Assad has regained the advantage in several regions of Syria, including the city of Homs. By the end of January, 2014, the Old City of Homs was still controlled by the rebels, but they realized it was a lost cause. Within a few weeks they completely withdrew, having failed to break the unbearable siege. The conquest of Homs permitted the Alawite government under Assad to consolidate their hold in central Syria, linking the capital, Damascus, to strategic areas along the Mediterranean coast. Through this suffocating siege and indiscriminate brutal bombings that led to mass evacuations, Homs literally became a ghost town; conceivable for a small town anywhere in the world, whether by war or for other reasons. But for a thriving city with well over a million in population, a ghost town was unimaginable. Although the Syrian Government allowed non-combatants (who were at least neutral to the government) to return to Homs, few have done so. Some who did return, at least to check on the condition of their homes in particular and the city in general, were stunned at what they saw. Multiply this Syrian family by hundreds of thousands of people and tens of thousands of homes (in Homs), and you get the gruesome big picture. Though the devastation is greater than any other city in Syria or Iraq, Homs is but one example of many cities and towns in two of several war-scarred countries in the Middle East and Africa. “Blessed in the nation whose God is the Lord…” (Psalms 33:12). This applied to ancient Israel when she loved, worshipped, and obeyed the Lord God. And to modern-day Israel, because God has begun to fulfill his magnificent promise to restore his special possession physically and one day soon spiritually. A few other nations have been blessed (mostly for a temporary period of time) including the United States of America, whose government was founded on Judaic-Christian principles found in Scripture. Whose God is the Lord, himself … or was. Conversely, how can we or why would we expect God to continue to bless and protect this once great nation when we continue to expel him from the hallowed halls of Congress, from the fertile grounds of our children’s schools and universities, from public display in town-squares, from mention of his name by our military chaplains, and even from many church pulpits across this land? This once great nation was built on Christian precepts and principles, but I fear we are no longer a “Christian nation.” We have replaced the true and living God and his Messiah with the god of secular humanism which, among many other grievous wrongs, not only allows but subsidizes the inexcusable sacrifice of millions of unborn children on the altar of abortion. God spared Nineveh, a city of a Gentile nation, Assyria, but only because her citizens turned to God for forgiveness. But Nineveh resumed her wicked ways and was eventually conquered, with Assyria completely wiped out as a nation by Babylon. Then Babylon by Persia, Persia by Greece, and Greece by Rome. And, where is the mighty Roman Empire today? Where is the Third Reich that Hitler boasted would last a thousand years? It lasted all of 12 years. All of the signs are clear and getting clearer that God’s final plan for the ages is unfolding in our generation. Listen to the words of our great God, who will soon judge the nations like never before. “…At the time I have planned, I will bring justice against the wicked … I warned the proud, ‘Stop your boasting!’ I told the wicked, ‘Don’t raise your fists! 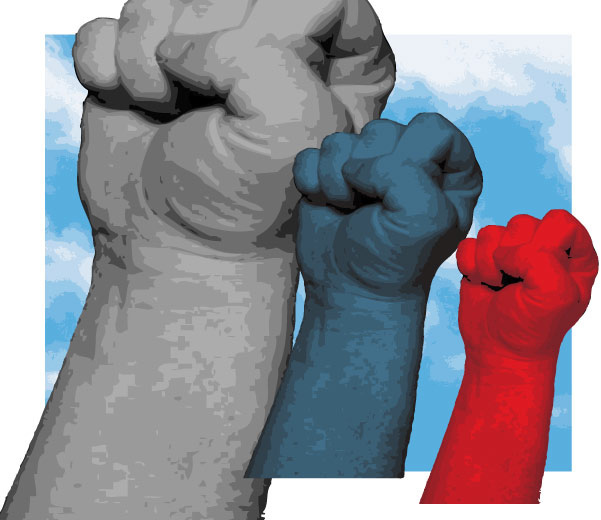 Don’t raise your fists in defiance at the heavens or speak with such arrogance.’ … It is God alone who judges; he decides who will rise and who will fall” (Psalms 75:2-7). And, “Now then, you kings, act wisely! Be warned, you rulers of the earth! Serve the Lord with reverent fear, and rejoice with trembling. Submit to God’s royal son, or he will become angry, and you will be destroyed in the midst of all your activities—for his anger flares up in an instant. But what joy for all who take refuge in him!” (Psalms 2:10-12). Our holy and just God equally extends compassion, forgiveness, and mercy. Although this conditional promise from the Lord was directed primarily to Israel, it also extends to Gentile nations in principle and practice, such as Nineveh and to the United States of America. 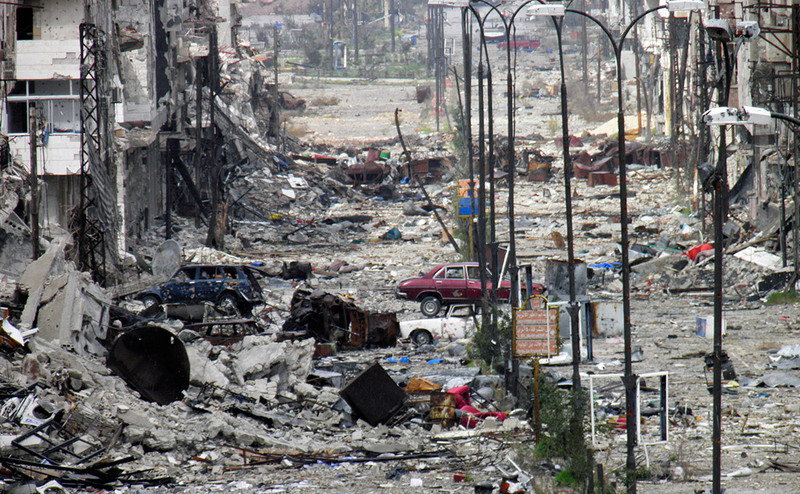 Indeed, there is no place like Homs on the earth. And thank God there aren’t too many more like it as we speak. One utterly ruined city is enough. But ever so sadly, there will be many more cities reduced to rubble during the massive man-made wars and God-imposed judgments of the Great Tribulation, and possibly some before the Rapture. For instance, during the last half of the Tribulation the awesome destruction of Rome encoded in Scripture as Babylon, for protection of the author of Revelation and other 1st century Christians. “Babylon is fallen—that great city is fallen! She has become a home for demons” (Revelation 18:2). And, “…How terrible, how terrible for you. O Babylon, you great city! In a single moment God’s judgment came on you” (Verse 10). And, “…All your luxuries and splendor are gone forever, never to be yours again” (Verse 14). Also, “How terrible, how terrible for that great city! … In a single moment it is all gone” (Verse 19). Here is a prophecy about another (the most well-known) city in Syria: “The oracle concerning Damascus. Behold, Damascus is about to be removed from being a city and will become a fallen ruin” (Isaiah 17:1). Having mentioned this in a couple of prior Eye of Prophecy articles, I’ll simply summarize (based on historical evidence both Biblical and secular) by saying that I’m convinced this prophecy was fulfilled when the Assyrians conquered Damascus around 732 B.C, then ten years later vanquished the ten northern tribes of Israel. 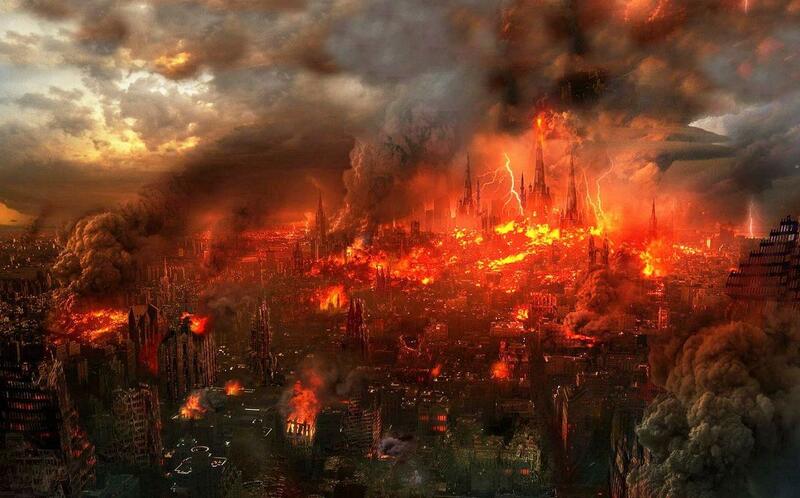 However, there very well could be another devastation of Damascus during the Tribulation (or even before). 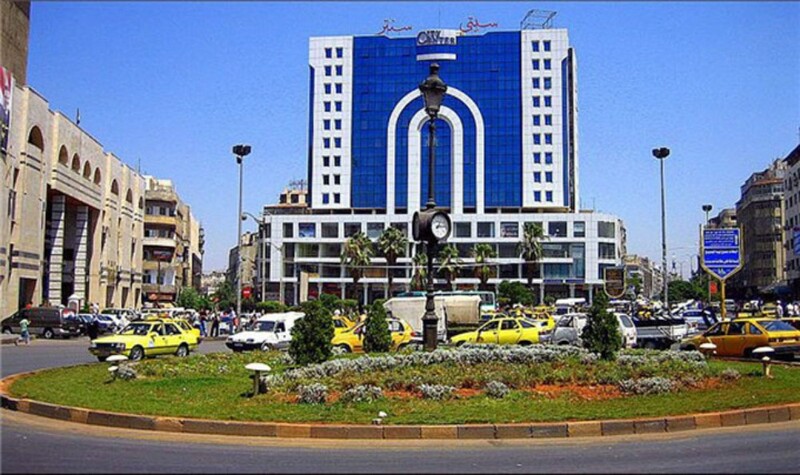 First, to clarify that Homs is an Arabic named city and is actually pronounced Hims. I waited until now because the pronunciation doesn’t work with my Wizard of Oz analogy of, there’s no place like Hom(e)s! As you can see by now, my awkward (if you didn’t know the correct pronunciation, the spelling would suggest Hahms) deception had a purpose. You do see it don’t you?! Let’s examine a more positive story that comes out of Homs, Syria. One of several examples the world over that (if the media cares to search and report) reminds us that something good can be found in the most shocking situations of life. That the darkest night will yield to the morning light. 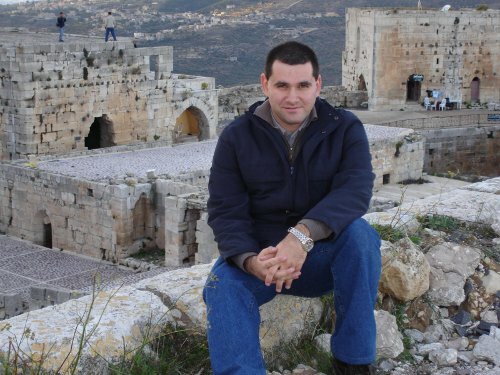 In a March, 5th, 2016 article posted on the online new source of Aish.com, written by Dr. Yvette Alt Miller, we are introduced to Aboud Dandachi, a 39-year old Syrian currently living in Istanbul, Turkey. I chose Dr. Miller’s article to dovetail with today’s Eye of Prophecy post, because Aboud’s pre-refugee residence was none other than Homs, Syria! Surprisingly, however, the article concerns Dandachi’s experience with and changed views of Israel and Israelis. *Note: Please consider reading the Eye of Prophecy article entitled, The Heart and Soul of Israel (posted 1-4-14). Although I’ve written many articles on or about Israel, that article is a microcosm of (as the title states) the wonderful and generous heart and soul of not just Israel as a nation, but the Jews as a people. It includes similar examples of Israeli aid and acts of kindness to those who are sworn enemies of Israel even more than the Syrians … Palestinians in the Gaza Strip and West Bank. Apparently, Dr. Miller discovered Aboud’s endeavor through a website he set up in December, 2015, for the express purpose of proclaiming to all who would listen, “Thank you, Am Yisrael,” which is the title of his website. Thank you, people of Israel. Israel’s unselfish and unrequited kindness even toward her enemies is the stuff that much Biblical prophecy is made of. Though she has fought Arabs and Muslim nations for her very survival, and continues to defend herself against almost daily terrorist’s attacks, Israel is beginning to fulfill her destiny. First as a nation reborn from the floods of dispersion and fires of Nazi death camps; and soon her wide-spread spiritual rebirth by opening individual and collective hearts to the Messiah who died for the Jews (and Gentiles) and rose from the dead to seal the New Covenant of Grace. Soon, very soon, Messiah Yeshua (Jesus) will return to set up his glorious kingdom of Righteousness, Justice, and Shalom from Jerusalem. “When I bring them home from the lands of their enemies, I will display my holiness among them for all the nations to see. Then my people will know that I am the Lord their God, because I sent them away to exile and brought them home again. I will leave none of my people behind. I will never again turn my face from them, for I will pour out my Spirit upon the people of Israel. I, the Sovereign Lord, have spoken!” (Ezekiel 39:27-29). Beginning with Messiah Jesus (the Light of the World) who changes our heart and alters our eternal destiny when we believe and receive him, culminating in his majestic return to make all things right in Israel and between Israel and the nations, Israel and the world will share in this (his) glorious light. Listen to the personal description (me, my, and him) of Messiah spoken about his coming (none other than Jesus of Nazareth who fulfilled ALL of the Messianic prophecies) through the prophet. “And now the Lord speaks—the one who formed me in my mother’s womb (the Virgin Birth) to be his servant, who commissioned me to bring Israel back to him. The Lord has honored me, and my God has given me strength. He says, ‘You will do more than restore the people of Israel to me. I will make you a light to the Gentiles, and you will bring my salvation to the ends of the earth’” (Isaiah 49:5-6). To acknowledge that Messiah as the Lamb of God has already arrived (two thousand years ago) to bring them salvation. And shortly to eagerly embrace him as their Savior Lion from the Tribe of Judah when he delivers them from the hands of their enemies in the final campaign against Israel led by the Antichrist and his coalition. However, one of their enemies will NOT be Aboud Dandachi! “Don’t let your hearts be troubled. Trust in God and trust also in me. There is more than enough room in my Father’s home. If this were not so, would I have told you that I am going to prepare a place for you? When everything is ready, I will come and get you, so that you will always be with me where I am. And you know the way to where I am going” (John 14:1-4). Though he spoke these words directly to his disciples, they (like all of his promises) are for, “…everyone who believes in him will not perish but have eternal life” (John 3:16). To the scene in the first passage above, his disciple, Thomas, questioned: “No, we don’t know, Lord. … We have no idea where you are going, so how can we know the way?” (John 14:5). To which Jesus replied in these magnificent words, often quoted: “I am the way, the truth, and the life. No one can come to the Father except through me” (Verse 6). Then the Jewish Apostle Paul reminds believers: “Above all, you must live as citizens of heaven…” (Philippians 1:27). Yes, believers in Yeshua are already citizens of heaven. One day soon we will take up residency there. Our passport to heaven has been stamped with the redemptive sacrificial blood of our great God and Savior, Christ Jesus. Of our glorious home in the New Jerusalem, John writes: “I saw no temple in the city, for the Lord God Almighty and the Lamb are its temple. And the city has no need of sun, or moon, for the glory of God illuminates (literally) the city, and the Lamb is its light. The nations will walk in its light … all the nations will bring their glory and honor into the city” (Revelation 21:22-26). Earlier in this astounding vision of what today is the very near future, John exclaims: “And I saw the holy city, the New Jerusalem, coming down from God out of heaven like a bride beautifully dressed for her husband” (Verse 2). “…The Lord himself will come down from heaven with a commanding shout, with the voice of the archangel, and with the trumpet call of God. First, the Christians who have died will rise from their graves. Then, together with them, we who are still alive and remain on the earth will be caught up (raptured) in the clouds to meet the Lord in the air. Then we will be with Lord forever. So encourage each other with these words” (I Thessalonians 4:16-18). There’s no place like home … there’s no place like home.